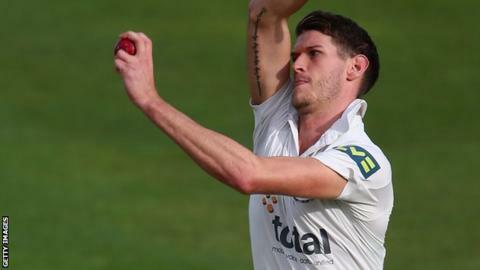 Gloucestershire had Glamorgan reeling on a rain-affected first day of the Division Two match at Cardiff. The hosts were reduced to 47-6, with opener William Bragg (25) the only batsman to make double figures. Gloucestershire's decision to bowl first was immediately vindicated when Will Gidman (2-9) took a wicket with the first ball of the match. And seamer David Payne (3-14) was left on a hat-trick when the rain came down just before lunch. Only 90 minutes of action was possible because of the rain and after several pitch inspections throughout the afternoon play was finally abandoned for the day at 17:45 BST. "Gloucestershire skipper Michael Klinger wanted a response from his bowlers after their poor performance against Hampshire last week, and he got it. "His attack utilised the gloomy conditions in the 19 overs that were bowled, and David Payne is on a hat-trick when play resumes. "Glamorgan lost a wicket with the first ball of the match, with Rees being caught behind off Will Gidman, but it was Bragg's dismissal that was the most irritating for them; after knuckling down he inexplicably played a loose shot and was well caught by Klinger."